From a young age, Madi Griemann followed in her father’s footsteps. Literally. A naturally curious child, she would tail close behind him as he walked about his mechanics shop, wondering what he was doing and the types of equipment he was working on. The formative years of her life were split between that shop and the industrial arts facility at her school in Moosomin, Saskatchewan, where it didn’t take long for Griemann to decide that she wanted a career in manufacturing. Griemann, 17, is one of four recipients of the national Women in Manufacturing scholarships, sponsored by Canadian Manufacturers & Exporters (CME), Fiera Foods, and Artistic Skylights. 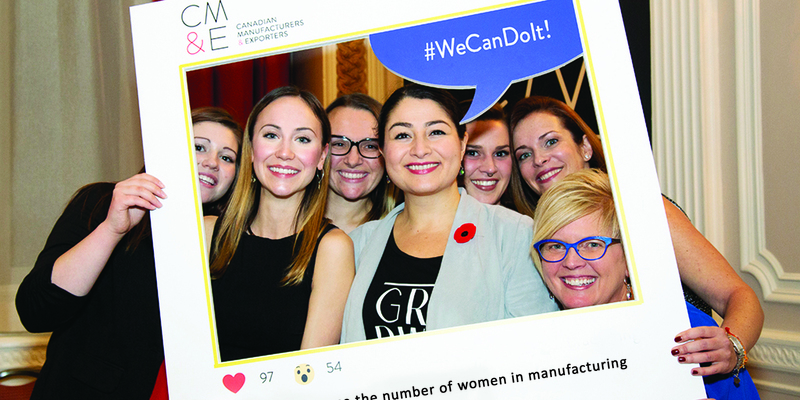 Women in Manufacturing (WIM) is a pan-Canadian initiative of CME that aims to increase the number of females employed in the manufacturing industry. The awards were presented in Ottawa this year at CME’s annual conference in support of the education of young women entering the manufacturing workforce. Ten scholarships in the amount of $4,000 will be given out between 2018 and 2020. Griemann is enrolled in the Innovative Manufacturing program at Saskatchewan Polytechnic in Regina, where the shop classes are still her favourite. She is expected to graduate in 2020, with plans of becoming a journeyman machinist. Griemann says that although some people question her decision to go into manufacturing as a female, the community at her school is highly supportive. Griemann maintains what she is most excited about is getting to do what she loves every day. Sarah Harris is another Prairie recipient of the national scholarship. Harris studies biomedical engineering at the University of Manitoba, and recalls a pivotal moment last June during her internship at the Orthopaedic Innovation Centre that solidified her desire to pursue biomedical manufacturing. Harris says witnessing the surgery and seeing all the tools in the operating room put to work made her realize she wanted to be a part of the manufacturing of medical devices. Now in her third year at the university, Harris also serves as a co-founder of the Women of Manitoba Engineering Network at the U of M. The group aims to promote opportunities for female-identifying engineering students, including financial support and networking events connecting them to mentors and role models. These are sentiments echoed by Rhonda Barnet, the outgoing chair of CME’s national board, as well as and president and COO of Steelworks Design. Women comprise 48 per cent of the Canadian workforce, but only 29 per cent of the manufacturing workforce. Through its recently announced We Can Do It! campaign, WIM aims to increase the number of women in manufacturing positions by 100,000 over the next five years. As for Harris, she says receiving the scholarship is a very validating experience.